Do you recognise yourself in any of these thoughts? Executives find invaluable support in a coaching relationship. Objectivity, combined with a mission to help identify the strengths as well as the areas to improve, make the Coach a precious partner in gaining clarity, planning more wisely and acting more efficiently. My distance coaching is powerful, flexible and economical. You will appreciate the flexibility of the telephone/VOIP sessions, for yourself or for your team. You will save time and money. Use a coach as and when you need to. Evaluate a difficult situation from an objective point of view. Help getting a new project off the ground. Find an objective person to discuss your ideas with. Boost staff performance and enhance managers’ skills. Clarify priorities and promote achievement. Motivate and improve internal communications. Help staff to adjust to evolution and transitions. Use a qualified, professional Coach. Coaching is a profession on its own and the better coaches are formed by recognised training school. True professionals have a credential from an independent professional organisation. Currently the main independent body is the International Coaching Federation( ICF) www.coachfederation.org. ICF member since 1998 – 3 years a Board Member of UK-ICF. 31 years of executive life in multinational advertising agencies (Y&R, JWT,GREY) in 7 countries. 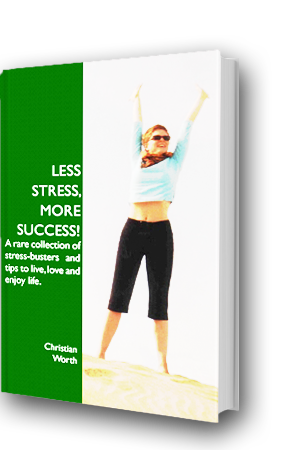 Less Stress, More Success – available on Amazon.com and in e-book format. See it in Books section. I am good value for money, as I work on the telephone and have low overheads. Give me a call on +33 5 5954 4912 or e-mail me for a FREE introductory session and discussion of practical details. Click here for a sample of what is in the "Less Stress, More Success" book.